You probably don’t consider yourself to be an event planner. Trust me, me either. But, hosting an event is a great way to network, acquire leads and spread the message about your brand! It’s a great way to get out from behind your computer and really get to know people! 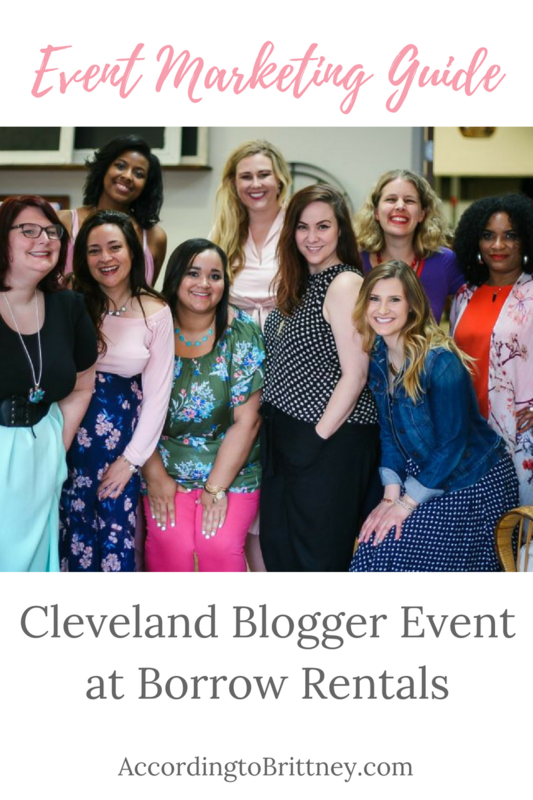 In my hometown of Cleveland, we have a growing and supportive blogger community. We normally meet bi-weekly and get together at local business’s around town to connect and support. I had an idea to add a photography element to one of our events because I know bloggers have a need for quality photos. So, I did it! After planning a successful event this past weekend, I wanted to share my tips on how to plan an event to reach your goals. As I mentioned before, bloggers need beautiful photos for their websites and social media. I knew this a blogger myself who still struggles to get the best photos! So, once I had the idea, I asked other bloggers. This step is crucial because you want to host an event that is valuable for those attending. Ask yourself what your attendees are getting of out of it. Connections, information, or in my case – photos! Next, ask your potential attendees if an event like this is worthwhile for them. If so, go for it! If not, you may want to re-think your event. This is often overlooked (even by me) but you should think about what is the actual goal of your event. My biggest goal for this event was to have at least 20 people attend, 2 photographers, and other local businesses involved. This is event wasn’t centered around my business, so I didn’t have any monetary (except to break even on expenses – which I did) or marketing goals. Think about what you want out of the event. Maybe it’s to talk to 10 new people, sell a certain number of tickets, or get 30 new people to sign up for your newsletter. The actual goal itself doesn’t matter, what matters is that you know what you’re working towards. Where are you going to put all these people? The location is very important because it sets the tone for the whole event. When looking for spaces, keep in mind what you want and need to make your event successful. Does the place offer catering? Can it hold X amount of people? Is it close to the potential attendees? When planning my photography event, I knew I needed a place big enough to hold at least 30 people, was in Cleveland, and was a great place to take photos. I got extremely lucky when a friend suggest Borrow Vintage and Ecclectic Rentals. Borrow is this especially unique venue in Cleveland that specializes in vintage furniture. Say you’re having a wedding, you can contact Borrow to rent some gorgeous vintage pieces to set the tone for your special day. Not only does Borrow rent furniture, but they also have a warehouse and beautiful event space. Any blogger will tell you the importance of natural light and we had plenty! I literally could not have found a better place to hold this event! Everyone had a wonderful time plus got amazing photos. Trust me, the event space makes a difference! Doing everything alone is overrated. Especially when you’re like me and have no idea what you’re doing. Search for other people and businesses who can help you throw a great event. Maybe someone who is in your niche or can provide something to the event that you can’t. I was able to partner with a lot of people to get my event off the ground. I couldn’t do it without Katie Logsdon of Katie Logsdon Creative, local blogger and photographer, or Larry Spencer of Spencer Photography, local wedding photographer. What’s a photography event without photos? I’m not a food person and all the food was literally purchased in pre-packaged trays. But, luckily, Annie of Annie’s Signature Treats, a local baker, supplied us with yummy treats. Plus, I was able to get the ladies glammed up with hair and jewelry. Shibani of Bombay Taxi Boutique brought her lovely pieces. My mother brought a ton of pieces from her Paparazzi jewelry business while my sister, a licensed cosmetologist, did hair (including mine). I was lucky to get some amazingly talented people involved. Of course, I can’t forget the bloggers who attended who really made it all happen. I love being able to connect with people who share my love of blogging! Created a google doc which included all the event details (when, where, etc. ), it also included links to register, a list of who registered, who partnered with me and all the financial information (venue costs, food costs, etc.). It was great because since it was a google doc, I could edit anywhere which was helpful when people registered at different times. When it comes to being prepared, I just say be early, clarify everything beforehand and bring anything you have the slightest urge you will need. For instance, I brought a clipboard and when I decided to do a sign in sheet, that thing was extra handy! You never know what you need! Planning events is not easy, but it can be rewarding! What are some of your favorite events to plan/attend?